There’s plenty of debate on the hows of getting your babies ears pierced, so it’s worth doing your research before you decide if you choose to have your little one’s ears pierced with a needle or a piercing gun. There is a lot of information out there, but a good place to start is by reading the Association of Professional Piercers position on the needle vs gun debate. There are many clean, reputable and reasonably priced options in the Durham area for whichever option you choose. It’s worthwhile visiting these locations in advance to get a feel for their staff, learn about how staff are trained, check out the cleanliness of the equipment and ask any important questions that you may have. The procedure is fast and most babies will only cry for a few minutes – similar to what you could expect at a vaccination appointment. A staff member will first sterilize your baby’s ears, and then a mark will be placed on the ear where the piercing will be made. You’ll be consulted at this point to ensure that you’re happy with the placement and symmetry of the piercings. Once you’re satisfied, it’ll be time to secure your little one to keep them safe. You’ll be asked to hold your little one’s head securely and their arms down for the procedure. The piercing itself is over very quickly. Some locations will even use two staff members to piece both ears at the same time. Make sure you ask at the beginning of your appointment so you know what to expect. Cost: The service is free with the purchase of a set of earrings which range from $45-79. You can expect to pay between $59-102 all up, including earrings, tip and tax. Cost: Ear piercing is free with purchase of Claire’s Starter Kit, which includes a set of earrings and an aftercare solution. Starter Kits range from $48-73, depending on the style of earring that you choose. You can expect to pay between $62-95 for the starter kit, tip and tax. Cost: $40 for both lobes. This fee includes the cost of the initial jewelry, which is made from surgical stainless steel. Expect to pay around $52 in total for the service, including tax and tip. Many moms apply a numbing ointment known as Emla cream before the appointment to reduce any pain. You can buy this online or at any local pharmacy for around $18 plus tax. This is best applied 40 minutes to an hour before your appointment. Make an appointment when the location of your choice is likely to be least busy. Typically, weekday mornings are the best time to go when it’s quiet and staff aren’t busy. Locations using the piercing gun will recommended starting with a 14 karat white or yellow gold earring, as this metal is the least likely to cause an infection using their method. 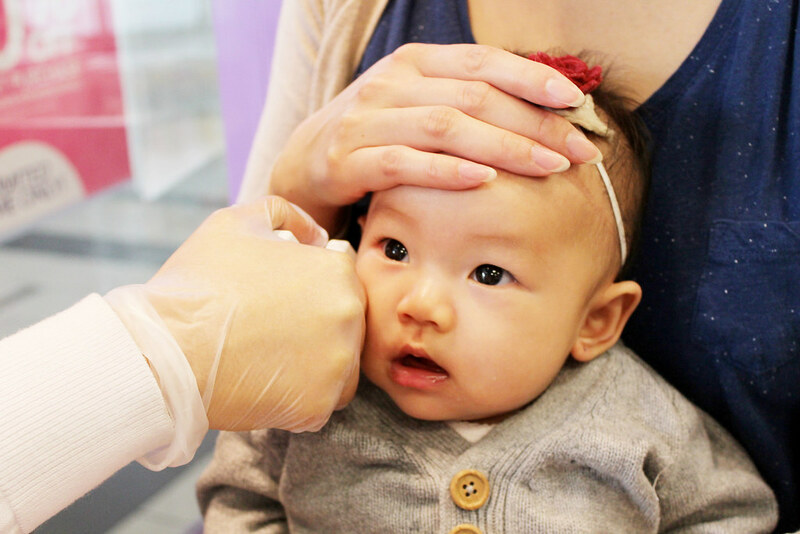 Some locations will require proof of your baby’s 2 month vaccination for the procedure. Either call ahead and ask or bring along your vaccination card as a precaution. Infections can happen, so it’s important that you choose a location that has trained staff to perform the procedure. Your piercer should be able to answer any question you have about skin needles and cross contamination. If you know of any other reputable locations that offer this service or have any tips of your own, I’d love to hear from you in the comments below!